Heres what I know about Titanic memorials in New York City. I owe thanks to an enthusiast in the Antiquities Division at the New York City Parks and Recreation Department, who listed for me some of the Titanic-related sites in NYC. These are the memorials I have been able to identify in Manhattan. They are listed from north to south. The Isadore and Ida Straus memorial stands at 106th Street and Broadway in a V-shaped park. 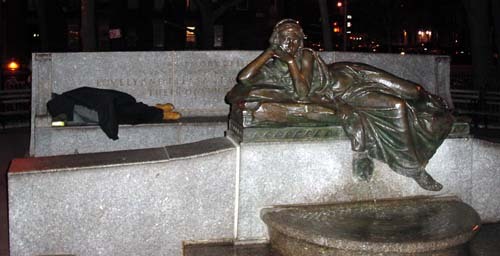 It portrays a reclining lady and supplies a bench. Isadore Straus was a department store millionaire. 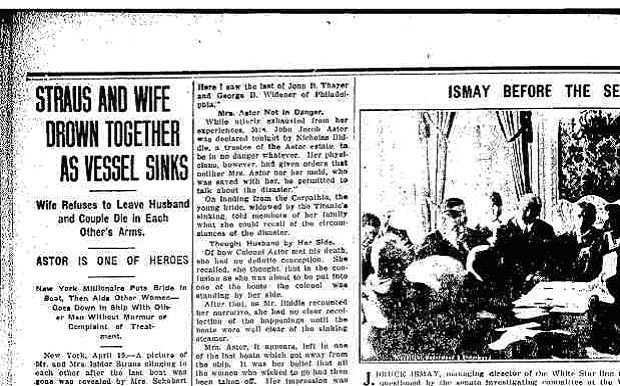 Mrs. Straus was offered a seat in a lifeboat, but she said: I have lived with him for 50 years - I wont leave him now, and they sat on deck-chairs until the end. This was portrayed in the movie, except they were shown on their bed in their cabin. My informant at New York City Parks and Recreation Department had attended a rededication in about 1999. The memorial is at the borderline of a slummy area, and it had fallen into disrepair. Many grandchildren of the Strauses were at the rededication. The statue originally had a reflecting pool; now it has flower beds (easier to maintain). Below is the plaque on the back of the memorial. 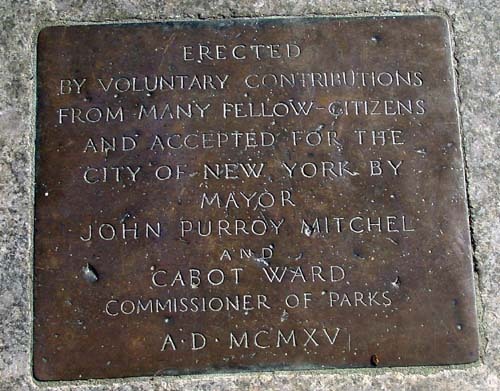 New York City Mayor John Purroy Mitchel, mentioned on it, later went to fight in the First World War and was killed, and there is a memorial plaque to him too, one block from the William T. Stead memorial to be described next. 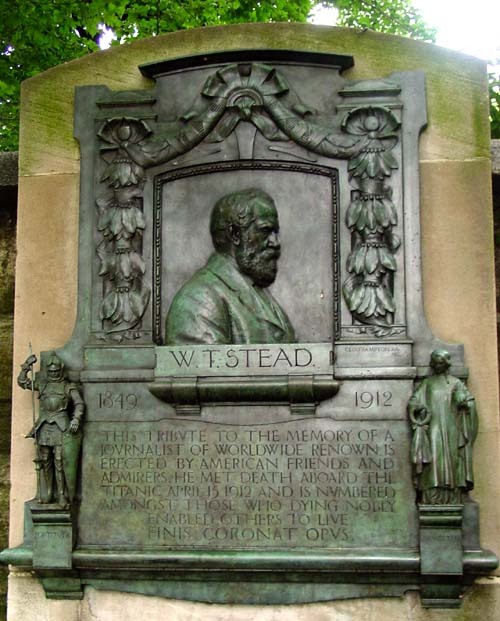 William T Stead was a crusading British journalist who rocked Victorian Britain in 1885 by revealing the scandal of child prostitution. Later he began to believe in spiritualism, and had written stories about passenger liner accidents before his death in the Titanic. His memorial is on the wall of Central Park at 91st Street and 5th Avenue (Central Park East). It is a copy of another on the Thames in London. It has lovely tiny figures of COURAGE and CHARITY. If she had arrived the Titanic would have docked at the White Star Line pier on the Hudson River on the west side of Manhattan. In 1910 a magnificent row of grand piers embellished with a unified pink granite facade replaced a hodgepodge of run-down waterfront structures on the west side approximately between 16th and 22nd streets. It was designed by the architectural firm of Warren and Wetmore, which was also designing Grand Central Terminal at the same time. I do not know which pier exactly the Titanic was destined to dock at, but it would have been in this stretch. In this famous photograph anxious crowds jostle for news of the disaster. You can see the sign CUNARD STORE on the wooden building and the facade of the Piers behind. Of the 2200 passengers aboard, 675 were rescued by the Cunard liner Carpathia, which arrived at the Piers on April 20th. 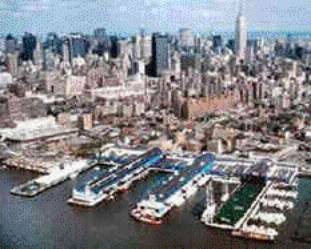 By the 1980s these piers were abandoned and derelict but four of them, with their facade, were saved to become a sports complex called The Chelsea Piers. Here they are from the water side, with the Empire State Building in the background. The (former) Seamans Institute is where survivors from the crew were put up. It is at the corner of Jane St where it ends at West Street and the Hudson River waterfront. Here it is viewed from across West Street. Behind the camera is the Hudson River. The White Star Line pier is only about 10 blocks north. The Institute had bedrooms above. On the river front (left) was a handsome dining room. On the right of the porticoed entrance was a chapel or meeting room. In this meeting room was held a meeting of inquiry into the events of the sinking. This room is now a theater. The building is now the Riverview Hotel, a cheap hotel much appreciated by adventurous European travelers. I saw socks hanging out of one of the windows. The Titanic Memorial Lighthouse stands at the entrance to South Street Seaport (to the right in this picture). The Titanic Memorial Lighthouse is not a lighthouse any more than the South Street Seaport is a seaport. 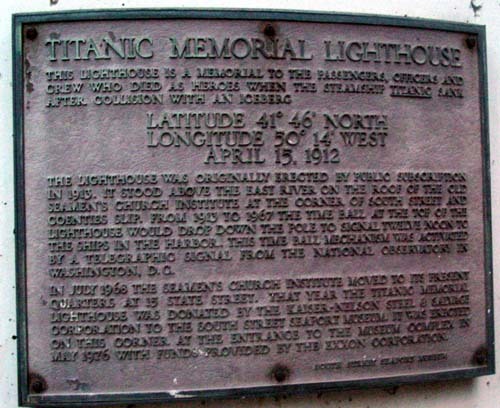 The Titanic Memorial Lighthouse was originally erected by public subscription in 1913. 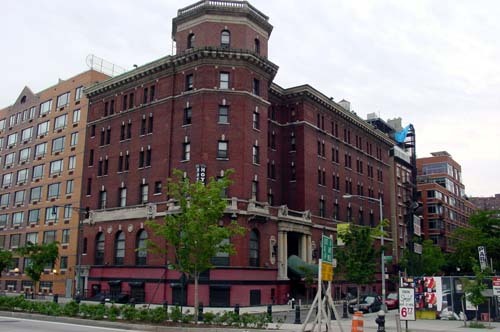 It stood on the roof of the old Seamans Church Institute, a club-house and dormitory for merchant seaman docked in New York, similar to but not identical with the Seamans Institute described above. 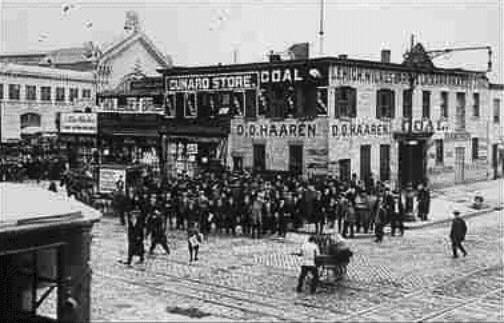 It formerly stood at the corner of South Street and Coenties Slip on the East River a few blocks south of the present location of the Memorial Lighthouse. From 1913 to 1967 the ball at the top of the lighthouse would drop down the pole to signal twelve noon to the ships in the harbor. In July 1968 the Seamans Church Institute moved to new quarters at 15 State Street. Its old site became an office building. I remember it on State Street - it still had seamen living upstairs, and a public cafeteria with old sea dishes like Irish Stew. 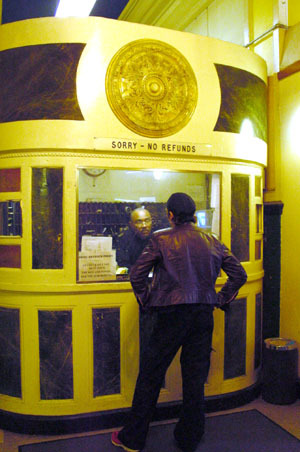 But in the 1990s it sold out to another high rise building, and moved to a 19th Century wharf building not far from where the Memorial Lighthouse ended up. There is no dorm; few merchant seaman lay over in New York any more. 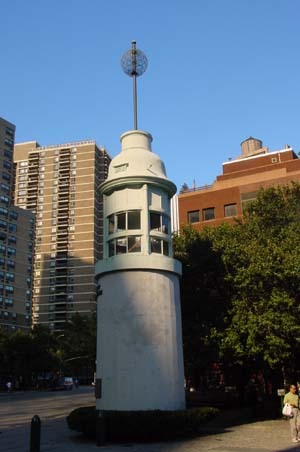 The Memorial Lighthouse was donated by the Kaiser-Nelson Steel & Salvage Corporation to the South Street Seaport Museum, around which the tourist Seaport was developed. The Wireless Operators Memorial is a small granite stele on which The Wireless Operators Veterans Society commemorates its fallen members. Carved in the stone is the inscription: Elevated in memory of wireless operators lost at sea at the post of duty. Wireless is an old term and a British term for radio. It stands in Battery Park at the foot of Manhattan, facing out to the inner harbor and the Statue of Liberty. The Veterans Society adds plaques for members lost on duty. One of the earliest was an operator on a Lake Michigan car ferry; the most recent have Russian and Vietnamese names. Near the bottom of the first column is: Jack Phillips, S.S. Titanic, April 15, 1912, Atlantic Ocean. 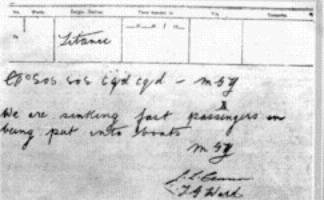 He, presumably, was the one who sent out the SOS - one of the first ships in history to send the new "SOS" distress call. I photographed the Memorial during Fleet Week, when U.S. Navy ships were docked in New York. Groups of sailors and Marines were in uniform in the park. Some sailors came by to look at it, so I asked if any of them were wireless operators. They ignored me. They may not know the word wireless.